CEI-IUL received Oliver Stuenkel as a guest speaker for the opening conference of the Master in International Studies. 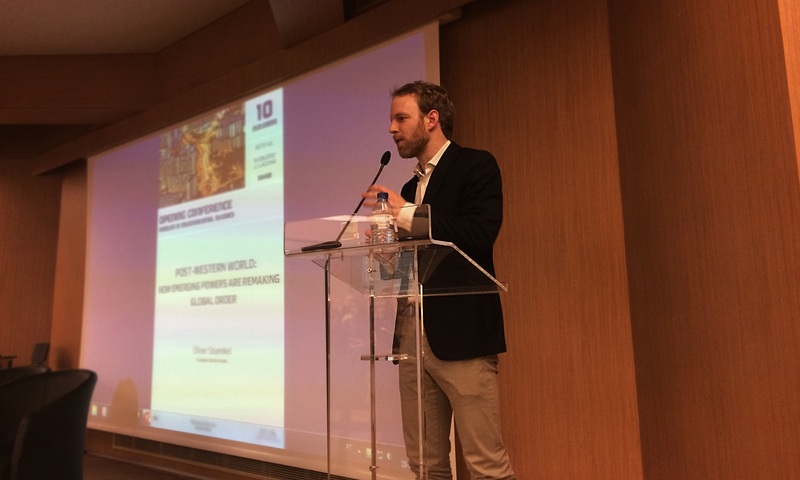 Professor Stuenkel addressed what he calls the Post-Western World, shaped by Emerging Powers. In his book with the same title, Stuenkel examines how emerging powers – such as China, India, and Brazil – are challenging the United States’ superpower status, consequently changing the balance of power at the global level. Oliver Stuenkel is an Assistant Professor of International Relations at the Getúlio Vargas Foundation in São Paulo, where he coordinates the São Paulo branch of the School of History and Social Science (CPDOC) and the executive program in International Relations. He is also a non-resident Fellow at the Global Public Policy Institute (GPPi) in Berlin, a member of the Carnegie Rising Democracies Network, and a columnist for Americas Quarterly. His research focuses on rising powers; specifically on Brazil’s, India’s and China’s foreign policy and on their impact on global governance. His books include IBSA: The rise of the Global South? (Routledge Global Institutions, 2014); BRICS and the Future of Global Order (Lexington, 2015); and the book that lends its title to our conference: Post-Western World: How Emerging Powers Are Remaking Global Order (Polity, 2016).